A year ago, Jeff bought me an AeroGarden for Christmas. It's great in the winter, when we can't grow anything outside. When I asked for it, it was with the idea that I could grow herbs cheaper than I could buy them in the grocery store. But, at $24 a kit (7 grow plugs and fertilizer), not to mention the original price of the entire unit ($150), I'm pretty sure we're not getting our money's worth. Anyway, a week or so ago, Jeff mis-gave (or Joey mis-understood) instructions for adding the fertilizer. She added 6 tablets instead of the necessary 2. We realized what happened the next morning when the herbs were all wilted and sad looking. So, Joey and I went to the local hydroponics store and bought GroMagnon 9-15-18 at the clerk's suggestion. It came in a 1 lb container for about thirteen bucks. We mixed a weak solution (1/2 teaspoon per gallon) and replaced all the water with it. -After growing the first set of herbs that came with the unit, I saved the dome lids and plastic things that hold the sponges. -I removed and threw out the sponges and old plant/roots (and then washed the plastic things). -Mixed up the fertilizer solution in a big container clearly marked 'Fertilizer'. (Making sure that I keep this out of the reach of little children.) I now use this to fill the reservoir. -Cut a piece of pantyhose to fit down in the plastic thing, with an inch or two hanging out over the top. -Filled with previously expanded coconut fiber. (I already had this stuff for use in my worm bin and was excited to see that they sell it at the hydroponic store.) This stuff needs to be well packed down in there to create a firm base for the plants' roots. -I made sure that the end of the nylons were tucked over and down under the lip of the plastic thing. Then I put it down in the hole, turning till it sat firmly. -Removed dome when seeds sprouted. Just make sure to use well washed pantyhose that don't have holes in them and to keep any stray coconut fiber from finding its way into the reservoir, as it would probably mess up the pump. So, I'm sure that the AeroGarden people won't be thrilled that I did this to mine (though I can't possibly be the first person to do this), but like Make Magazine says, "Void Your Waranty". Added Update- It did work pretty well, other than the fact that it got sort of moldy. Fashioning an opaque guard would work to block out the light and stop that. I've thought of making one out of plastic (maybe from a cleaned yogurt cup or something similar). Guess I need to give it another try, but I normally only pull this thing out during the winter. My other bit of advice is to start all the seeds at once, otherwise some of them are too far away from the lights while others are growing right up against them. WOW!! They look great. I just started my adventure! I agree, the Aerogarden is a "premium" kind of solution. I get more payback out of mine by huddling my little pepper plants around it. Just a thought. I have illustrations on my blog. If you want to grow something extracirricular, try Burpee's Better Boy seeds... mine sprouted in two days in this thing. just wondering if the seeds you planted using your stocking method was a success? 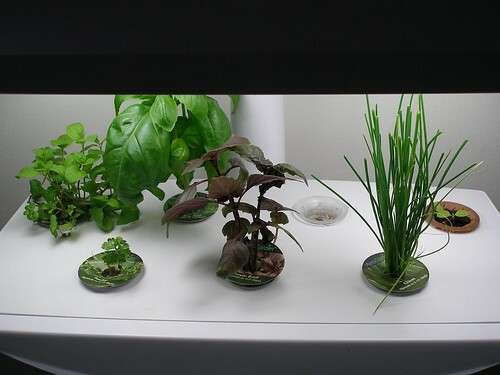 I'm very very keen on buying myself an aerogarden, but am worried about running costs - your ideas seems workable! Sharm, it did work pretty well, other than the fact that it got sort of moldy. Fashioning an opaque guard would work to block out the light and stop that. I've thought of making one out of plastic (maybe from a cleaned yogurt cup or something similar). Guess I need to give it another try, but I normally only pull this thing out during the winter. I did the same thing except I used several layers of cheese cloth and perlite. I used a basic hydroponic solution and got good results. What perlite that escaped into the resivoir floated and posed no problem to the pump. I'd like to develop an organic fertilizer but I'm leary of the smell.